stayed tuned for our first Shooter Profile! We've made some changes to our website! Check out the Shooter Resources page. Info in the Milestones and Shooter Profile section to come! Another Gun Lottery is in the works for 2019. Stayed tuned for more details on the biggest and best lottery to date! Janaya Nickerson appointed Secretary of the Atlantic Provinces Trapshooting Association. Welcome aboard Janaya! October Around the ATA Article added. Have an article, news or photo for our website? Contact us and we'll post it. September Around the ATA Article added. Results and the Photo and Video Galleries are now complete for the 2018 AP Shoot. Oops. Photo link corrected for the Shoot Photos Photo Gallery. PSC - APTA Gun Lottery Winning Ticket: 0037. The winner has been notified. Congratulations Wayne Kelley of NS! The 2018 Atlantic Provinces Championships at the Highland Gun Club was a huge success. Ready for this year's AP shoot? Got your ammo, hotel reservations and presquadded for the event? Presquadding end Sunday, August 19. Got your PSC-APTA Gun Lottery ticket? Limited numbers remaining!! Highland Gun Club upgrades are complete and are ready for this year's shoot. Click here for all the details. NS Provincial Trap Shoot a success. Complete list of winners to follow soon. Check out how the AP shooters did at this year's Canadian Trap Championships under the APTA Abroad section. Squads are filling up fast for this year's AP Shoot. Presquad now at www.presquad.com for your chance to win free ammo! See shoot program for details. 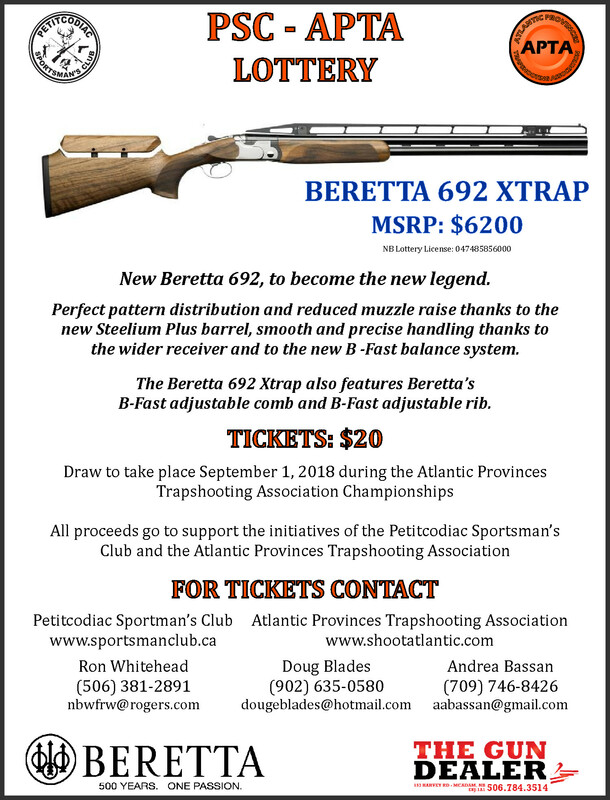 Got your ticket on the Beretta 692 Xtrap? Click here for details. If you'd like a printed program contact us! Tickets for the PSC- APTA Gun Lottery are selling fast. Get yours today. See poster for complete details. Old Man Bailey turns 85. Details in our Club Shoot Results section. Club and Shooter Updates under our Club Centre section. Visit our Club Shoot Results for the latest news! This year's Atlantic Provinces ATA Provincial Shoot Program will be available any day now! View the program cover page here. We're working on a Shooter's Special Rate at a local Yarmouth hotel. Stay tuned! PSC- APTA Gun Lottery Tickets now available. See poster for complete details. Trapshooting has begun for the season at the St. John's Rod and Gun Club! Congratulations to Peter Tucker for winning the 2018 Southern Grand Handicap Championship with a score of 99/100 - a personal best handicap score for Peter. This annual ATA Satellite Grand held at the Silver Dollar Shooter's Club in Odessa, Florida is one of the ATA's premier shoots and attracts some of the top shooters in the ATA ranks. Peter's 99 in the main Handicap event topped a field of 495 shooters. Well done Peter!! Photo Credit: Trap & Field Magazine. Copyright to the Amateur Trapshooting Association. All rights reserved. In the early hours of this morning, Dwight Smith, Canadian Trapshooting Association president, lost everything in a house fire. While he and his dog escaped, there is nothing left but ashes. A go-fund me page has been started to help Dwight on the long road to putting his life back together. Please consider donating and share widely. Click here to donate. A Site Update Archive has been added with a complete list of updates. Our main page will now only show the most recent updates. The APTA Abroad section updated with 2018 shoots our shooters will be attending. Stay tuned for updates! The February 2018 Around the ATA article has been added. Club Shoot Calendar section updated. 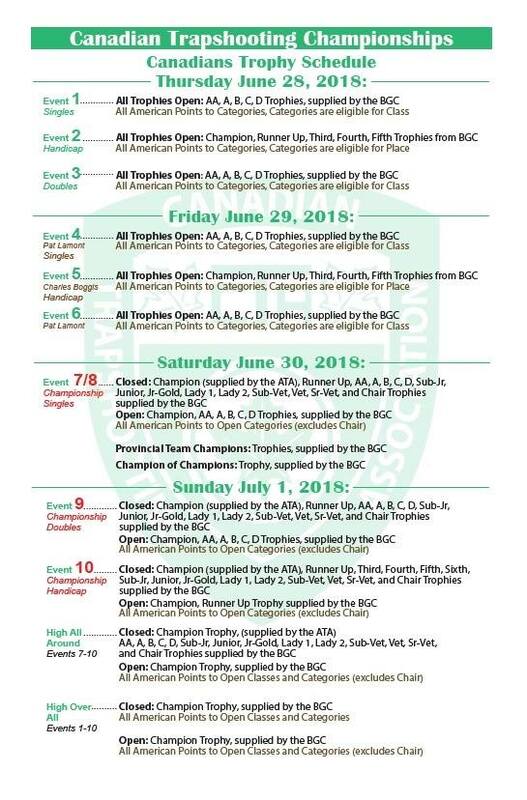 Petitcodiac Sportsman's Club Winter League information. 20 shooters registered! The main page now includes an image carousel to give shooters quick information on what's happening locally and around the ATA. The Club Centre menu is where shooters can find local gun clubs, upcoming shoot information, shoot results and where Gun Club Managers can find a link to all the ATA information they need. The APTA Hall of Fame is in the works so stay tuned for more information. The APTA Abroad section now includes the Canadian Trapshooting and Grand American Results and highlights our AP shooters as they compete around the ATA. A new image service will also allow us to post more photos of our APTA'ers Abroad. The 2017 APTA Results have been updated. Check out the APTA Shoot menu and the APTA Shoot Results section.